There are several different forms of shoulder instability. Some dogs experience a low-grade repetitive sprain injury to the shoulder ligaments or a strain injury to the muscles of the rotator cuff. Affected animals are often middle-aged, athletic, large breed dogs. Lameness in affected dogs is often worse after exercise. Dogs affected by high-grade sprains and strains of the shoulder joint may experience an obvious permanent limp. How is shoulder instability diagnosed? Diagnosis of shoulder instability is made using a physical examination test that is usually performed under sedation or general anaesthesia. Your dog’s orthopaedic clinician will also perform radiographs to check for the presence of osteoarthritis and our advanced diagnostic imaging team may also take imaging of your dog’s shoulder joints using MRI which can be helpful when assessing dogs with suspected strain injuries. All of the above procedures require either sedation or general anaesthesia. 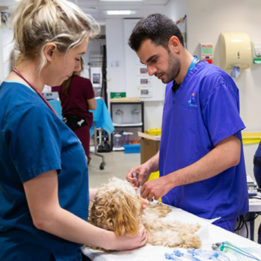 During these procedures, your dog will receive one-to-one care by one of our nurses from the prep nursing team who are all trained and highly experienced in anaesthesia and sedation. Following advanced diagnostic imaging, your dog may undergo arthroscopy of the shoulder joint. Arthroscopy is a keyhole surgical procedure that uses a fibre-optic camera inserted into the shoulder joint to allow visual examination of the associated joint tissues and will provide an optimum opportunity for your orthopaedic surgeon to evaluate any abnormalities further. Treatment of shoulder instability depends on the grade of sprain and strain, and the degree of instability. Low-grade injuries are often treated non-surgically with anti-inflammatory medication, exercise modification, physiotherapy and hydrotherapy. A home care physiotherapy plan will be designed specifically to your dog’s needs by one of our chartered physiotherapists and outpatient hydrotherapy appointments can be made through our rehabilitation service. High-grade injuries can be treated using prosthetic stabilisation, shoulder fusion, or total shoulder replacement. Prosthetic stabilisation: The surgical technique for shoulder stabilisation is modelled on the techniques used for the management of rotator cuff tears in humans. We have pioneered the application of human implantation systems to dogs with excellent success. Shoulder fusion (arthrodesis): In animals affected by the most severe problems affecting the shoulder including severe instability, dislocation (luxation), articular fractures and arthritis, arthrodesis may be the best option. This is called a “salvage” surgery because it is used as a last resort where other techniques to save the joint would have a poor probability of success. We have excellent experience with shoulder arthrodesis and have published the largest case series describing this technique in dogs. Total shoulder replacement: The technology and implants for canine total shoulder joint replacement have been pioneered at Fitzpatrick Referrals. The first clinical cases were operated here, and we are currently the only veterinary hospital offering this procedure worldwide. Read more about total shoulder replacements.